Joe’s writing his alphabiography for a school assignment. It’s a story of his life with a section for each letter of the alphabet, starting with A, for Addie, his best friend, through Z, for Zachary, the boy that might someday become his boyfriend. His alphabiography is almost like a journal: he talks about his crushes, about his family, how it feels to be bullied. He’s a great cook, is horrified by the thought of kissing, and favors loud Hawaiian print shirts. He has a boyfriend, Colin, who is just not quite ready to come out of the closet yet, and there are some guy-guys who’ve been picking on him, but Joe strives to be positive. I usually end up reading more high school level books, and this is written for the younger crowd, so it was a refreshing change. Actually, refreshing is the perfect word for Joe, himself. He’s optimistic, self-confident, and his indomitable spirit permeates the book. I love his language: creative, casual, and approachable. His character comes off as so earnest and friendly, that you want him to be real. Furthermore, James Howe has done a wonderful job handling the bullying issue without allowing the novel to be consumed by it. The result is a light, pleasant, and encouraging read. I think you’re going to like it! 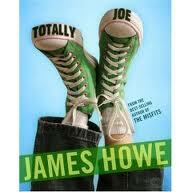 For the record, James Howe is the author of my much-beloved Bunnicula series! Howe, James. Totally Joe. Athenum Books: New York, 2005. 189 pp. Ages 10 and up. This is the companion book to The Misfits, so that is a great place to start if this sounds like a good book. However, I read Totally Joe first, and it was just fine on its own! Also, look for Addie on the Inside, coming out soon! Posted on November 3, 2011 by ShannaPosted in ALA Rainbow List, Nontraditional Format, Realistic FictionTagged bullying, coming of age, Coming out, fitting in, GLBT, James Howe, middle school, Misfits.